His stock went up Thursday when he skated the best performance of his career to win the Olympic gold medal, ending an 18-year reign of Soviet and Russian skaters in men’s figure skating. Russian Evgeni Plushenko, the 2006 Olympic Champion, finished 1.31 points out of first-place despite winning the short program. 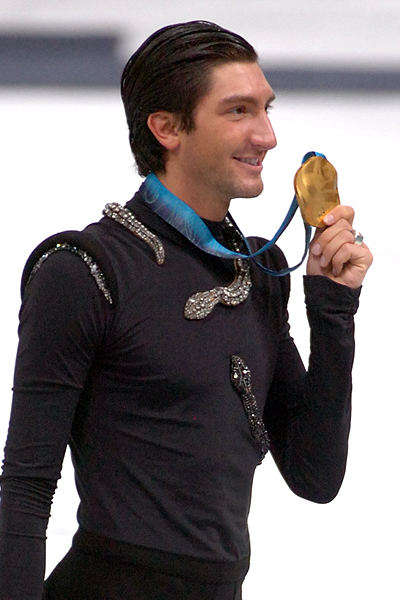 Lysacek also won the 2009 World Championship in March. Daisuke Takahashi of Japan won the bronze medal with a score of 247.23. Three-time U.S. Champion Johnny Weir finished sixth, one slot lower than 2006, with a score of 238.87. Two-time U.S. Champion Jeremy Abbott, who was 15th after the short program, jumped to ninth place with a final score of 218.96. Lysacek is the first American to win the men’s gold since Brian Boitano won at the Calgary 1988 Olympic Winter Games. He also becomes the first reigning World Champion to win the Olympic gold medal since American Scott Hamilton did it back in 1984. “To be mentioned in the same sentence as people I’ve idolized like Scott and Brian is amazing,” the Napeville, Ill., native said. He is the 13th skater from the United States to be crowned an Olympic Champion, with the last being Sarah Hughes’ victory at the 2002 Olympics in Salt Lake City.